I cannot say enough good things about this series! It's powerful, moving, engaging, makes you feel as if you reliving history as you read the series. John Lewis is a true hero. He proves that one person can make a huge difference in this world. There were so many times while reading that I caught myself saying I can't believe that this only just took place in the 1960's. I can't believe people acted this way. Can't they see we're all the same? We're all people. It doesn't matter what color we are, we're all people. The courage of everyone involved in their movement to me is one of the most amazing things in our history. We must always learn from history and carry with us the lessons it teaches us. Everyone needs to read March given our current political environment. We can't go back, we must always move forward. 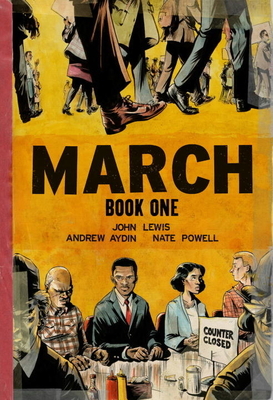 Congressman John Lewis (GA-5) is an American icon and key figure of the civil rights movement. His commitment to justice and nonviolence has taken him from an Alabama sharecropper's farm to the halls of Congress, from a segregated schoolroom to the 1963 March on Washington, and from receiving beatings from state troopers to receiving the Medal of Freedom from the first African-American president.